Imagine owning a pet that doesn't need to be trained, walked, fed or groomed  ever. That's exactly what California ad executive Gary Dahl was after when he came up with pet rocks in 1975. 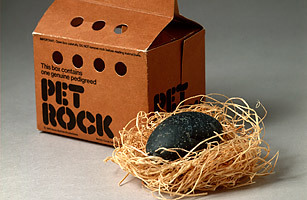 Tired of the hassle and responsibility that came with animate house pets, Dahl developed a toy concept that was 1% product and 99% marketing genius: a garden-variety rock, packaged in a comfy cardboard shipping crate, complete with straw for the rock's comfort and holes so it could breathe during transport. The Pet Rock Training Manual  a tongue-in-cheek set of guidelines for pet owners, like housebreaking instructions ("Place it on some old newspapers. The rock will never know what the paper is for and will require no further instruction")  helped turn the scheme from an amusing gag gift into an inexplicable toy craze. By Christmas 1975, Americans were hooked. Although the fad was long gone by the following year, the rocks  which were collected from a beach in Baja, Calif., for pennies each and retailed for $3.95  made Dahl a multimillionaire in about six months.